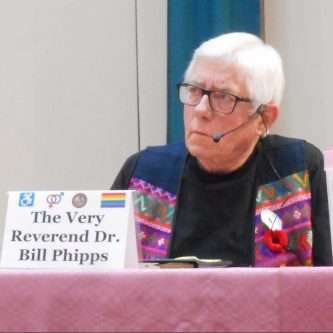 On Saturday November 10, Kamloops United Church gathered with many members of the community to participate in a public forum exploring the role of Privilege in our society and in our lives. Inspired by the negative public response to a poster campaign intended to start a conversation about privilege in a neighboring school district, the goal of this forum was to explore the role of Privilege in our own lives and to consider what our personal responsibility might be. The panel of diverse perspectives: Jessica Vliegenthart,Sam Numsen, Bill Sundhu (event moderator), Bill Phipps (guest speaker), Michele Walker and Aaron Sumexheltza. Bill Sundhu, a Human Rights lawyer and former Judge acted as moderator for Saturday’s discussion. Mr. Sundhu first related his own story and perspective on privilege. He was a child of one of the first Sikh families to immigrate to Williams Lake from India; his parents were illiterate and his father was subsequently seriously disabled. It was this early experience, his educational opportunities, and his observations through the lens of a member of the judiciary that informed his remarks. Each panel member was then given an opportunity to talk about their personal experience with privilege, or lack thereof. Jessica Vliegenthart is a woman, a lawyer, and uses a wheelchair, due to a spinal cord injury. Jessica acknowledged the dichotomy of her privilege as an educated professional, and also being a woman, a mother and disabled. Sam Numsen, the president of Kamloops Pride discussed his own privilege as a white “straight-passing” male, but shared how even in Kamloops that he and his partner and others of the LGBTQ2+ community have been subject to slurs and the possibility of violence. Michele Walker, who works for the Kamloops Y managing programs for women and children who have experienced violence, provided this insight: for someone on the negative side of the privilege equation, there can be fear that addressing privilege will make their situation worse. Michele’s wisdom included the reminder that sometimes the best thing an ally can do is to stop talking and listen. The voices of those lacking privilege are the ones that need to be heard. Aaron Sumexheltza is the elected Chief of the Lower Nicola Indian Band, and practiced law in Kamloops before being elected. Aaron shared a parable told to him by his grandmother about muskrat and beaver, and the failure of beaver to return the tail he stole from muskrat. At the conclusion of the forum, Aaron returned to that fable and reminded us all that muskrat and beaver, by necessity, still swim in the same pond, just as the settlers and Indigenous peoples must co-exist. The afternoon concluded with an opportunity for attendees to direct questions to particular panelists. The moderator Bill Sundhu guided the group through respectful discussion and at 4 pm the forum ended on a very positive note with the responses to a question about “what now?”, “what positive steps can we take in our own community?” The forum on Privilege hosted by Kamloops United Church: Centre for Community and Spiritual Discovery was a success and was a hope-full impetus to carry on the conversation.